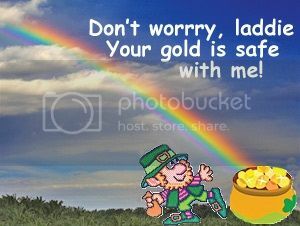 But too often, people are so focused on the money that they continually jump from opportunity to opportunity trying to find the mythical Golden Egg that the goose has laid or … that Pot of Gold at the end of the rainbow guarded by a Leprechaun. It’s doubtful these people ever find what they are looking for, much less become successful at anything they do. It got me thinking about the advice I would give Newcomers to the business. Do the Right Thing and commit – really commit to your opportunity? Commit to your company and the coaching, training and support they offer that will develop you into a valuable asset to yourself and others. That commitment includes becoming a Successful Network Marketer for the Right Reason....not some crazy “reason” - like a loudmouth, used car salesman type claiming he could make you rich in a month, if you join him. Perfect what you do and become duplicatable by building relationships with people – people who also want to be successful Network Marketers. Build a team and teach your team to do the same things you have done to succeed. Commit to helping and mentoring others just as you were helped and mentored along the way..
Then commit to head in the Right Direction – towards your goal of becoming a Successful Network Marketer with a growing team of your own who trust you and want to be successful too! Do the Right Thing, for the Right Reason going in the Right Direction and Success will follow! Great Success and Abundant Blessings! If you have questions about any of this, please give me a call at 704-296-2933. Good morning Sandy what an honest and heartfelt press release. I fit in that category years ago moving from one opportunity to the next. 3 years ago I finally decided to stay focus and become coachable. Now I am reaping magnifying rewards. Wonderful work Sandy much success and have a golden day. Sandy what a wonderful post. Many times Marketers commit but to the wrong thing and that's making money for themselves. I don't mean to say making money is a bad thing, that's why we are here, however, it's so much more exciting when your downlines making money or at being recognized at least it is to me. I get such a kick out of seeing my team growing.